In a new study, they show that through a fairly simple process the waste material can be converted into useful chemicals — including ones that can make the desalination process itself more efficient. The approach can be used to produce sodium hydroxide, among other products. Otherwise known as caustic soda, sodium hydroxide can be used to pretreat seawater going into the desalination plant. This changes the acidity of the water, which helps to prevent fouling of the membranes used to filter out the salty water — a major cause of interruptions and failures in typical reverse osmosis desalination plants. 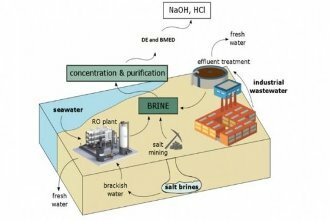 Sodium hydroxide is not the only product that can be made from the waste brine : Another important chemical used by desalination plants and many other industrial processes is hydrochloric acid, which can also easily be made on site from the waste brine using established chemical processing methods. The chemical can be used for cleaning parts of the desalination plant, but is also widely used in chemical production and as a source of hydrogen.